This entry was posted in Computers and Internet, Home Server, Raspberry Pi and tagged Computers, Home, Raspberry Pi, RPHS. Bookmark the permalink. I’ll try it out that way and clarify, thanks. I always handle my IP assignments from the router through leases, so I didn’t run it this way. caught me for a while on the use of CAPITALS !!! I’ll update them to match now. I guess I’ll keep the capitals, since that’s what the original Eric Jodoin script uses. In the “Configure Firewall” section, the interfaces pre-up directive did not work for me. Not sure why, probably because I rely on my router dhcp server for ip address assignment. Executing the same script manually did the trick tho. I ended up installing the iptables-persistent package instead. At install, it persists the already configured ipv4 and ipv6 rules. May be a good idea to add that as an alternative. Cheers! It could be a copy paste thing. I’ve had issues with WordPress trying to “fix” my posts. This usually means that hyphens get turned into em-dashes, which looks fine on-screen, but doesn’t work at the command line. If you copied and pasted the command into the script, but hand typed them at the command line, I’ll bet that was it. I’ll re check the text on that one. I like the way you’ve got a one stop guide to setting up all the tools to turn a RPI into a very useful server….Thanks. To stop OpenVPN from starting TOO soon. I hope this is not why I don;t have the service file! Thank you for pulling this all together. Couple questions: if I am using wireless then I should change eth0 to wlan0 here? Can you recommend a simple test to see if the port is open on the rPi? For the VPN settings, that looks right to me, although I’m at work and can’t verify that at the moment. For the WLAN settings themselves, I’d have to try that myself to be sure. I’ve not tried it wirelessly, so it could read a little differently. You might try looking through the comments on the previous version of the article too. I seem to remember the subject coming up there in the past. I’ll add this to the list of revisions, and try it out the next chance I get. It’s too bad this is a Monday. I should have a chance this week though. Thanks for the response. No need to do anything further as I got working as stated. After I found the openVPN log on the server it indicated I had a error in my verb statement; checking it I had missed the 1. All is good – thanks again for the write up. I can’t honestly say I’ve done this on the Pi since I’m the only user of mine, but all that should be required is to create multiple keys, one for each user or device that’s going to connect. You can’t use the same key more than once simultaneously, but if you generate the keys per-device rather than per-user, you’re supposed to be able to connect more than one device at a time. I’ll have to give it a shot and see what happens myself. I’ve followed these instructions several times but never managed to get everything working. Today have decided to ask for help! I’ve put the .ovpn on the client laptop and am using an EE Mobile connection so I can be “off-LAN” but still physically have all the computers in one place to do the testing. I’m running openvpn client v2.4.2 (latest at May 2017). Connection is successful, I get awarded IP: 10.8.0.6. So – it looks like I get connectivity, but no routing and no access to resources on the LAN. Well, it’s a little hard to guess without actually being there, but have you made sure you can ping those machines by those addresses when you’re on the LAN? I’m just starting with the most basic things here, but if those machines don’t respond to pings due to firewall issues or something, that would explain it. For your second example, are you pinging the Pi that OVPN is actually running on, or a different Pi somewhere else on the network. If not for the first Ping being successful, I’d almost suspect that it’s not really bridging the two networks like it should. I’m far from an Open VPN expert, but since the problem is not Pi-specific, and might affect regular desktop users as well, it may have come up on the OpenVPN forums (https://forums.openvpn.net/). I have recently had to rebuild my network at home, so I’m still trying to get this all set up again as well. I have moved to a 10.x.x.x address as well since 192.168.x.x seems to have conflicts wherever I go (work, public networks, etc.) I may get to that this week, and I’ll see what comes up. There is only the one linux device on my network at this time, the RPI v3, so it is both the VPN gw 10.8.0.1 and the internal LAN IP 10.10.10.107. All the windows machines on the LAN are ping-able from within the LAN. Thanks for the referral to openVPN forums – I will ask there but unfortunately the conversation gets above my head very quickly, in particular on the linux side. I wanted to use openVPN rather than Windows Server’s built-in VPN as the windows offering is just username+password secured whilst openVPN uses certificates (which I wanted) but I’m no linux expert so had hoped that following instruction would be enough alone to get me there…. Good luck with your own migration onto 10.x.x.x I hope you either succeed – or if you hit this same issue then you resolve it and can help me further! Basically, it’s an automated install of the whole thing. If there’s a setting that simply got “wrong” somewhere along the line, then maybe an automated setup will fix things. It’s open source on GitHub, so with any luck it’ll stay up to date and know how to deal with any hiccups that come along. It kind of obviates the need for my entire article, but the posts are still useful for understanding exactly what’s really going on. I checked out PiVPN, and I can honestly say it totally automates almost the entire process covered here in my blog post. About the only thing it didn’t get quite right was letting me fill in my no-ip address, but you can just edit the resulting .ovpn file with any text editor and fix that. This thing seriously took care of every single step. I’m going to need to update this post soon and say “read through all of this if you want to know what’s going on, but seriously… just run PiVPN”. It’s that good. I wish there were scripts like this for all of the steps of setting up a server. I mean, I wouldn’t have the blog entries then, but I can always find something else to write about. edit: my third PING is supposed to read that I’m PINGing other IPs I know to be on my LAN e.g. 10.10.10.x where “x” is a range of machines I know are up and running. Some serving web sites (IIS), some SMB/windows network shares etc. Mel and Glen, A little feedback on PiVPN – After reading about it here I gave it a try and it simply resolved all of the issues I’ve had over some time with OpenVPN. I’m able to connect remotely from my other devices and travel router. Great information on a great script. Thanks! If I install and configure openvpn according to your tutorial on CentOS 7, will it work? And do I have to create the file “/etc/firewall-openvpn-rules.sh” as iptables is replaced with firewalld(firewall-cmd) on CentOS 7? Or is there a way to configure that ‘NAT’ rule through firewalld? If It is possible to populate that ‘NAT’ rule through firewalld(firewall-cmd) would you be kind enough to show us how to do it? In general, yes it should work, but as you mentioned already, things are going to be very different. You’ll use Yum instead of apt-get, and your system does not use iptables. There’s no reason why it shouldn’t work, but I’ve never done it, so I can’t tell you exactly what the steps are going to be. Surely someone out there has written something on this topic. It looks like there’s some interest in teaching the PiVPN script to work on CentOS as well (https://github.com/pivpn/pivpn/issues/205), although it’s not finished yet. from a Windows 8.1 client. And I was successful. Would you test the configuration and make a script out of it just like you did with pivpn for debian based systems. If you are interested, tell me how can I send the documentation I made from my tests. I did not write pivpn. It automates the same process I documented on my blog, and more, but I didn’t write it. I’m sorry for wrongly assuming that you did create pivpn. I’m sorry to bother you. Mel, Great information, I originally started setting up the RPHS after watching your video on pluralsight. I then discovered that you had a version 2 of the setup. Do you have any instructions for Stretch? The directory structure is different in Stretch than it is in Jessie. It uses dhcpcd.conf vice interfaces. There is no openssl.cnf file, so you have to link ” ln -s openssl-1.0.0.cnf openssl.cnf” file etc. When I try to run pivpn, I get a report that everything works correctly. I reboot, pivpn -a, create clients, it reports that it was successful but there is no ovpn subdirectory created, and no .ovpn files stored on the pi. I am definitely a NOOB when it comes to Linux / debian / Raspbian. I have been able to setup everything to this point, putty, VNC, webmin, samba, hdd with shares, minidlna. My home network has MS Essentials Server 2016 that provides dhcp, I’ve googled and failed to find anything that actually explains OpenVPN on Raspbian Stretch. Hmm. I’ve been letting pivpn take care of that part for me and haven’t had any problems. I haven’t built a stretch instance from scratch yet though. Mine was upgraded in place. I’m hoping to get to that soon though. If check the pivpn pages or forums. Surely they must be aware of any problems by now. I set this up successfully using pivpn when rebuilding my RPHS after an SD card crash. # change to the easy-rsa directory. # rename the old certificate for reference. # rejoice in fixed vpn capability. It should be possible to extend the lifetime of the generated certificate, but I figured that would just make it less likely I would remember this information when it happened again, so I just set a reminder in advance of the next timeout, the default seems to be 180 days. I’ve been using a Pi server for a long time (thanks to you, so thank you! ), and did not update for a long time. Every thing was working perfectly, until I recently updated it. Now the OpenVPN doesn’t work without the “After=multi-user.target” on the service file. The problem is when I add it, ssh stop working and I always get the message “System is booting up. See pam_nologin(8)”. Any suggestion to solve it? Well, I can’t say I’ve seen that exact behavior. Interestingly, I just updated all of my servers yesterday, and my openvpn seems to be working. One thing to try is completely reinstalling the affected components. I’ve done that a few times to fix broken bits. About once a year, I completely rebuild the whole thing, usually when they’ve made a major change to Raspbian. Ok, thanks. I was avoiding that, but will stop with this laziness and do this. And maybe its time to move from my raspberry 1 after all… LOL. 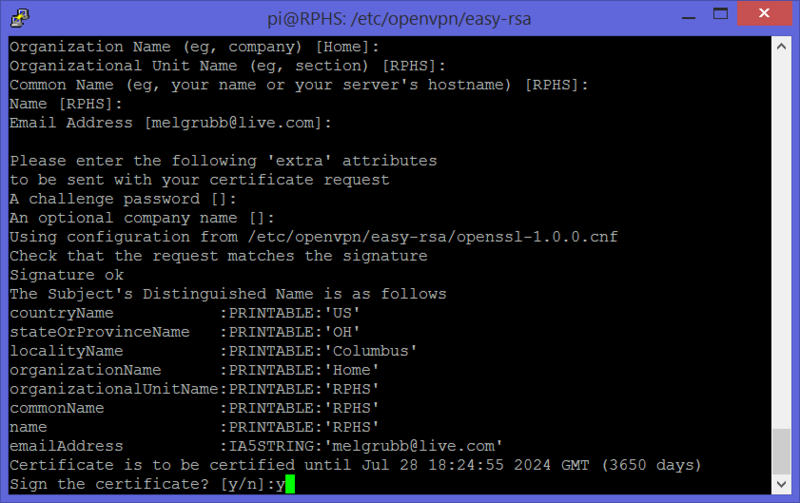 I have been reading and following your blog and implementing your directions, so when I restart my pi after going into the openvpn service and add “After=multi-user.target”, it decides that it can’t authenticate my normal user. Can you give me any pointers on this issue? I downloaded the openvpn program for my pi within the last year. It sounds like I may have to revisit this article when I have time. Something has changed. I’d try the openvpn site, wiki, forums, etc first. Surely it’s come up. I’ll also be checking the raspberry pi forums to see if there are other reports of this behavior. Thank you for the reply! I will definitely do that and if I find anything I will let you know!